The Crater Rim Drive is an 11-mile (17.7-kilometer) route encircling the active Kilauea volcano in Hawaii Volcanoes National Park. The road takes you past Kilauea’s summit caldera and large pit crater. Along the way, you’ll find museums, a lodge, lava tubes, numerous overlooks, and trails to explore deeper into the park’s environment. The volcanic activity in the park means conditions are constantly changing so keep your plans flexible. Start the drive at the Kilauea Visitor Center to get up-to-date information and watch a movie that shows recent eruptions. Then, continue into the park to see the action in real life. Expect to see steam vents, fissures, sulfur banks, and craters. You can make the Crater Rim Drive in your own car or join a bus or van tour. 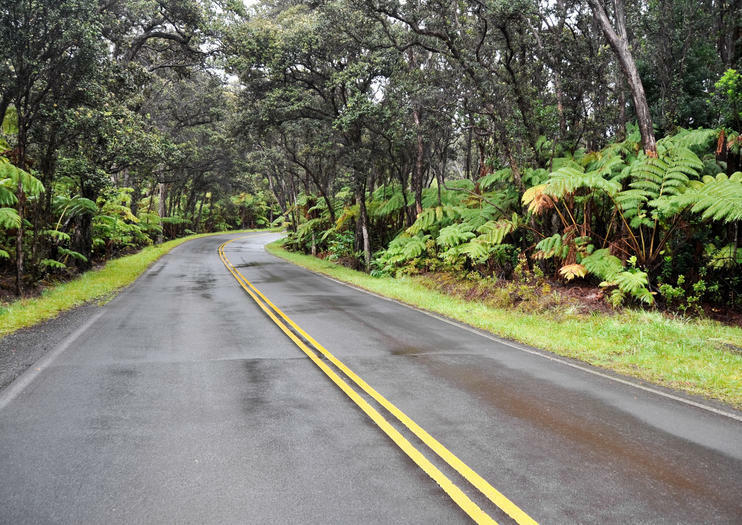 You can also bike the rim on a tour that combines sights, exercise, and learning about the Big Island’s geography. The 30-minute Crater Rim Drive showcases the park’s main highlights. The paved road does not require four-wheel-drive. Be prepared for rainy, windy weather, and bring a jacket if you plan to spend time out of your car. Closures in the park are common due to volcanic activity. Volcanic gas can include hazardous toxins. Hawaii Volcanoes National Park is located 30 miles (48 kilometers) southwest of Hilo and 95 miles (153 kilometers) southeast of Kona on Highway 11. Follow Crater Rim Drive to the right after the entrance station to begin your trip at the visitor center. If you are staying on a different part of the island or visiting on a cruise ship, numerous tours and shore excursions include the Crater Rim Drive. The park is open 24 hours a day year-round, with the Kilauea Visitor Center open from 9am to 5pm. Visit in the early morning or late in the evening to beat the crowds and traffic on the route. Hiking trails parallel many sections of the Crater Rim Drive, inviting visitors to leave their cars and explore further into the park on foot. If you have the day to spend, try the 3.2-mile (5-kilometer) Halema'uma'u Trail, which crosses the Kilauea Caldera. For a shorter hike, stop at the Devastation Trail parking area and hike the paved, wheelchair-accessible trail through the cinder outfall from the eruption of Kilauea Iki.